Get your own mobile TV on the go with via Globe Postpaid plan with their latest Cloudfone Excite 451TV offers. You can now watch your favorite TV shows and channels anytime you want, just put it on your desk or on your palm then scan for available network. This is a good alternative not to miss latest news and series on TV for only 599 pesos per month. It's time to level up on your smartphone experience, from texting to calling then browsing you can enjoy watching TV right on your mobile phone. 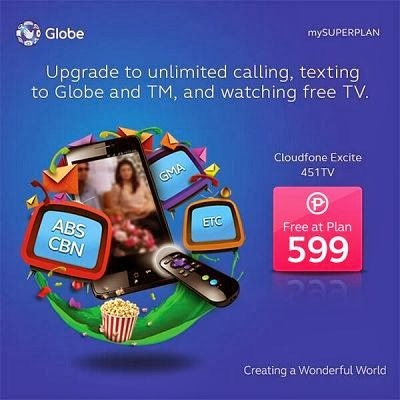 With Globe mySuperPlan 599, you’ll get free unlimited call and texts plus the handset. If there’s a remaining peso value, you can have it as your monthly consumable for browsing and other network service usage. Do note that if you are going to use data or internet on your postpaid SIM use internet.globe.com.ph APN or access point. Be aware also on top of the bill charges when using mobile data as this plan doesn’t include free browsing. You may also check other Cloudfone handsets available at Globe Postpaid. This plan promo is available for new subscribers and new postpaid line applicants only. Just visit your nearest Globe Store to inquire about this offer or you can call their hotline for assistance. You can also apply online just visit ww.globe.com.ph, fill all the needed fields and upload all the requirements needed to complete the application process.